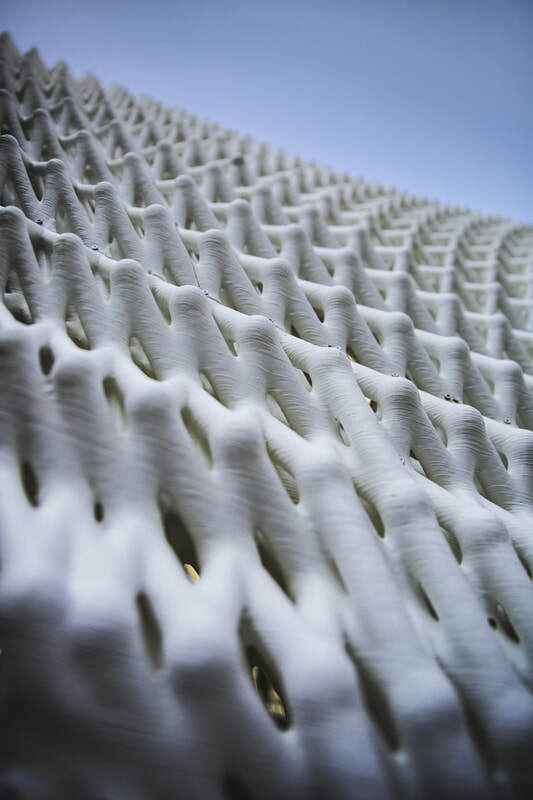 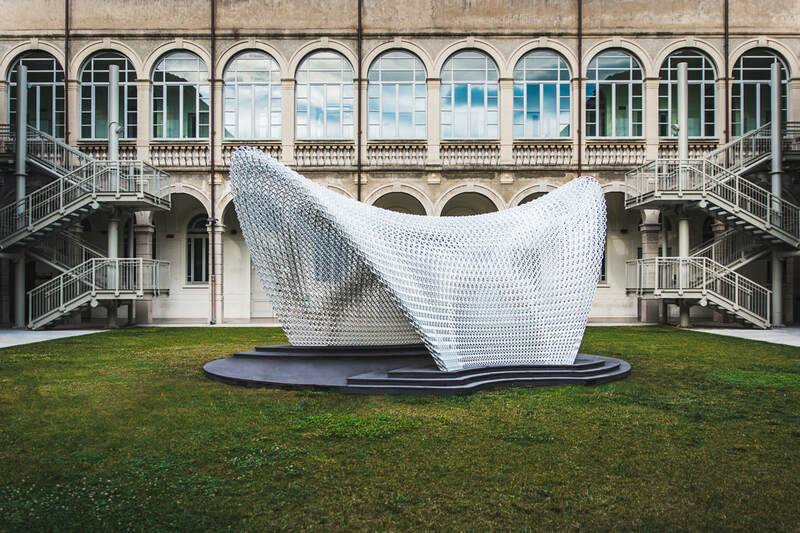 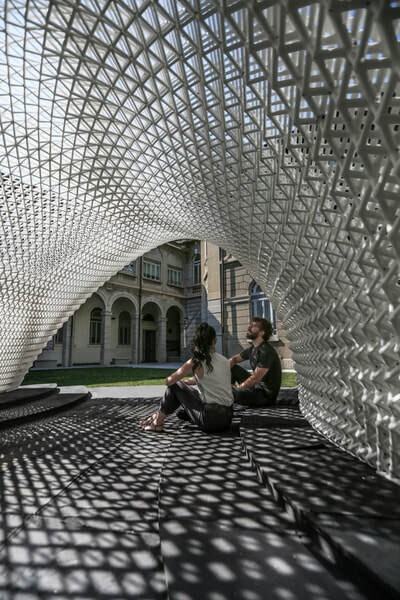 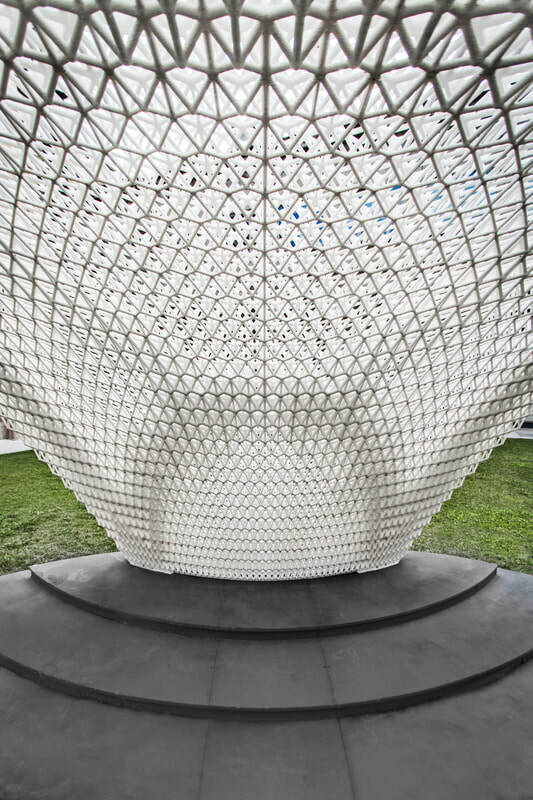 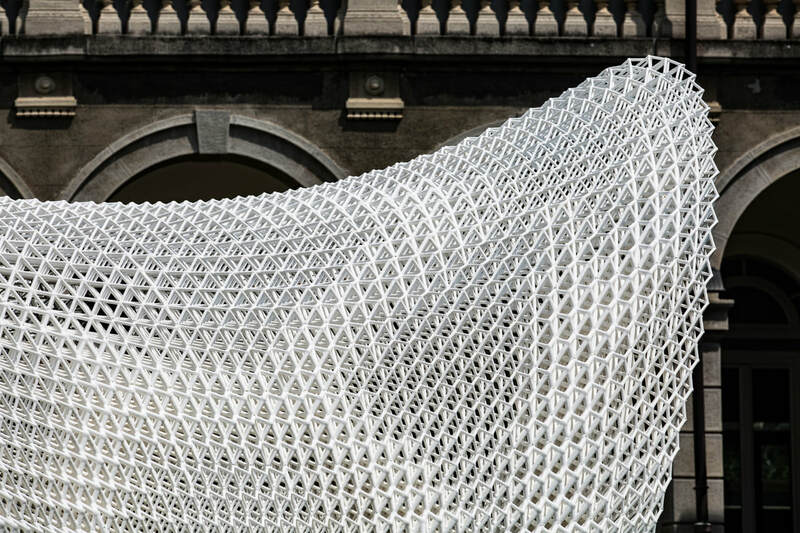 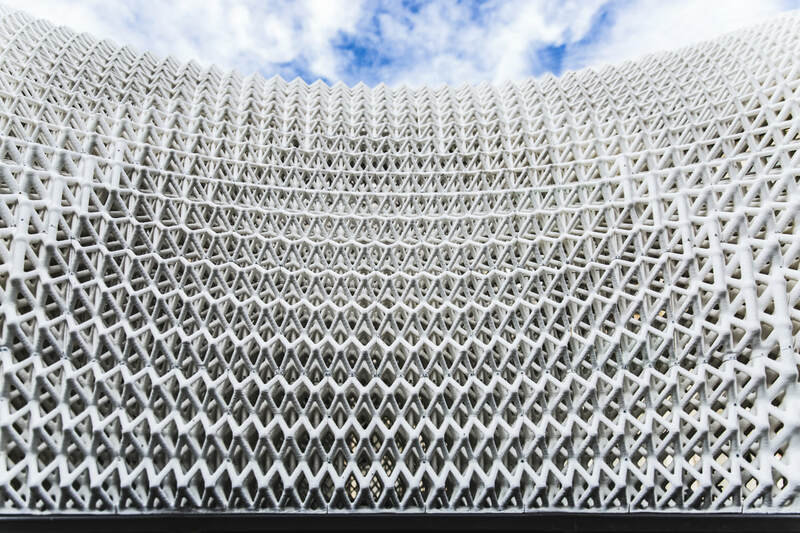 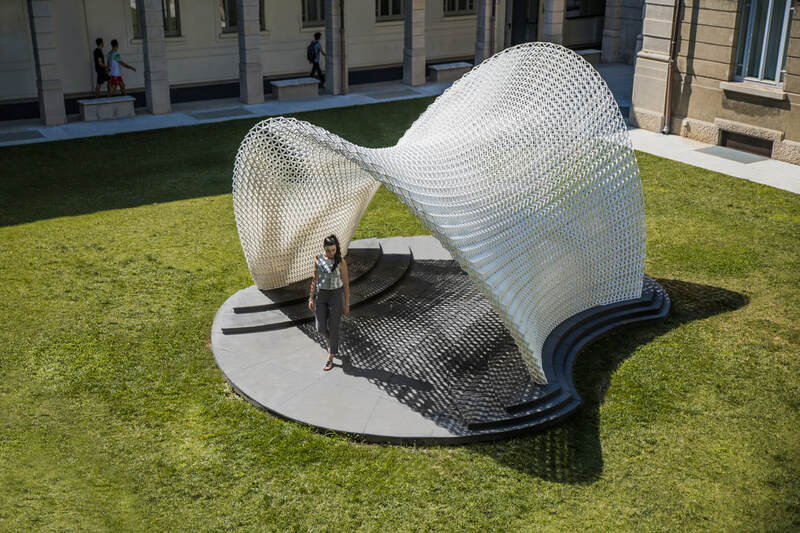 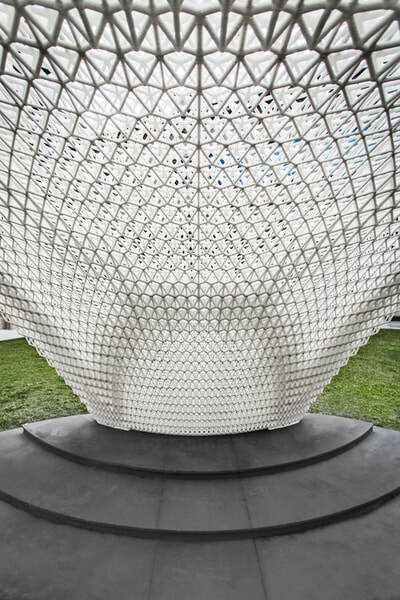 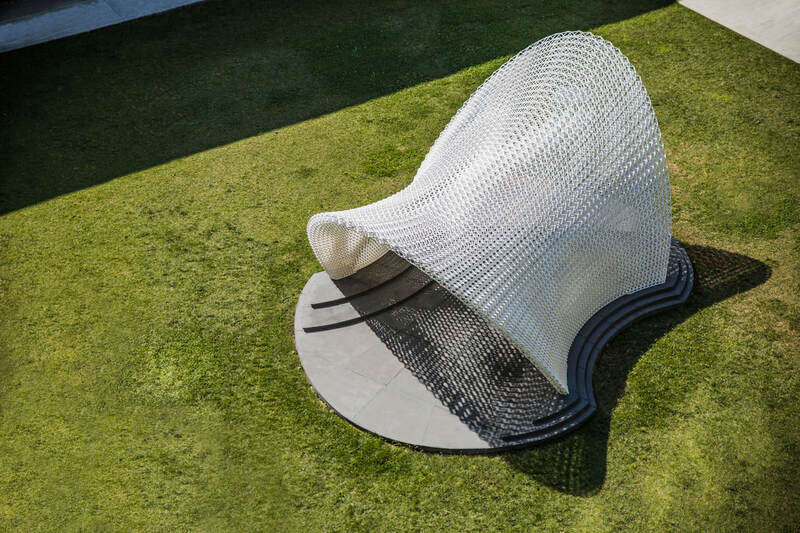 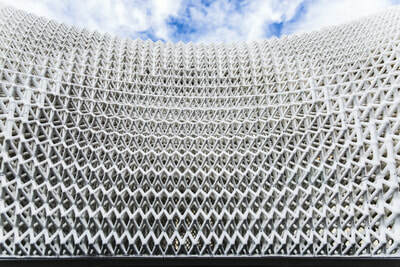 Trabeculae Pavilion is a lightweight architecture that fuses advancements in Additive Manufacturing with bio-inspired computational design. 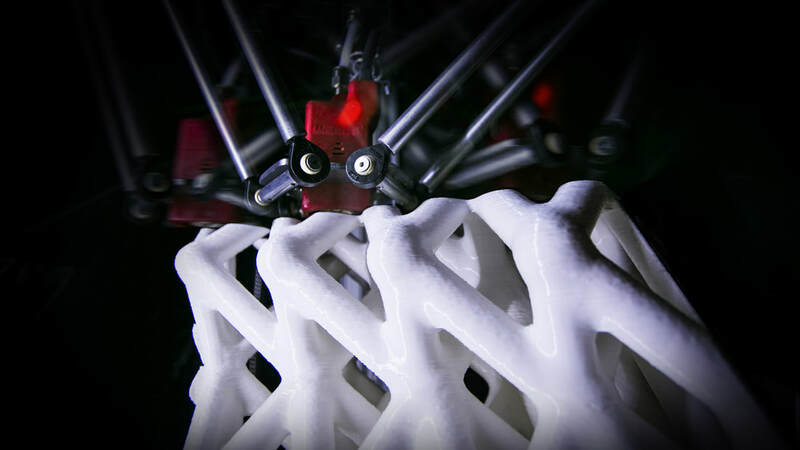 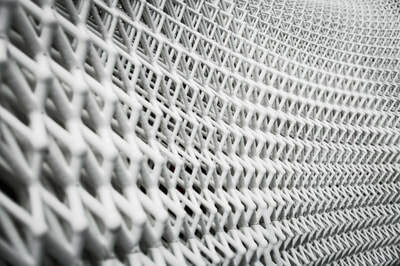 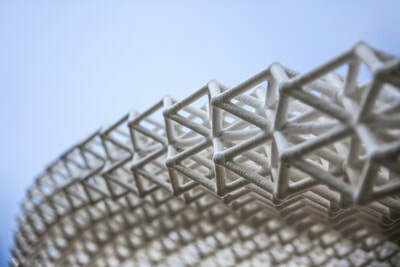 The project looks into 3D Printing for answers to the emerging problem of scarcity in material resources. 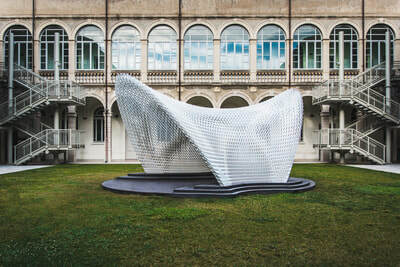 The design is based on a computational process that finds inspiration in Nature, specifically in the materialization logics of the trabeculae, the internal cells that form the bone microstructure. 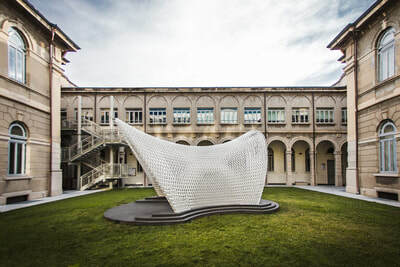 From this investigation, custom algorithms have been developed to support the creation of a cellular load-responsive structure with continuous variations in sizing, topology, orientation and section, in order to maximize material efficiency. 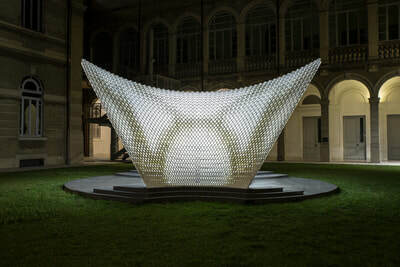 The built pavilion is a load-responsive shell composed by 352 components covering a total area of 36 square meters, additively formed by a 112 kilometers-long extrusion of a high-resistance biopolymer, specifically developed with industrial partner FILOALFA® to elevate Fused Deposition Modelling (FDM) to construction purposes. The innovative methods involved for the design allow for an efficient material distribution at multiple scales, which permits to obtain an extremely resistant and lightweight structure. 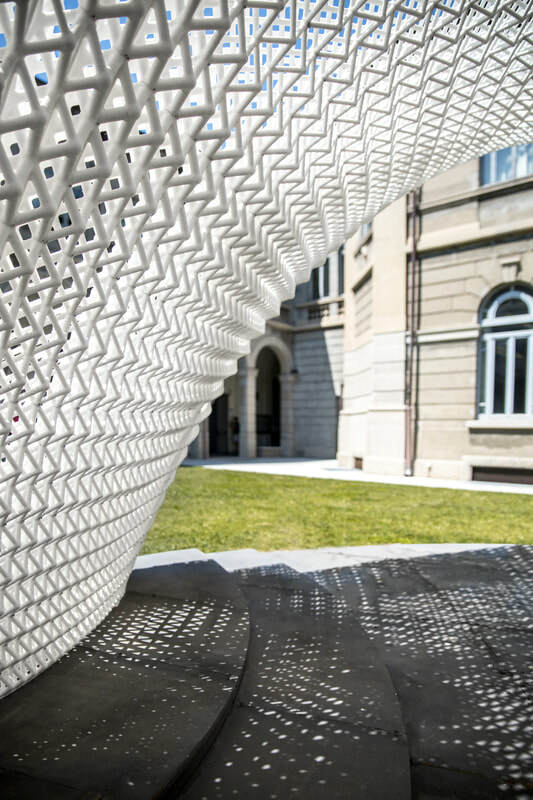 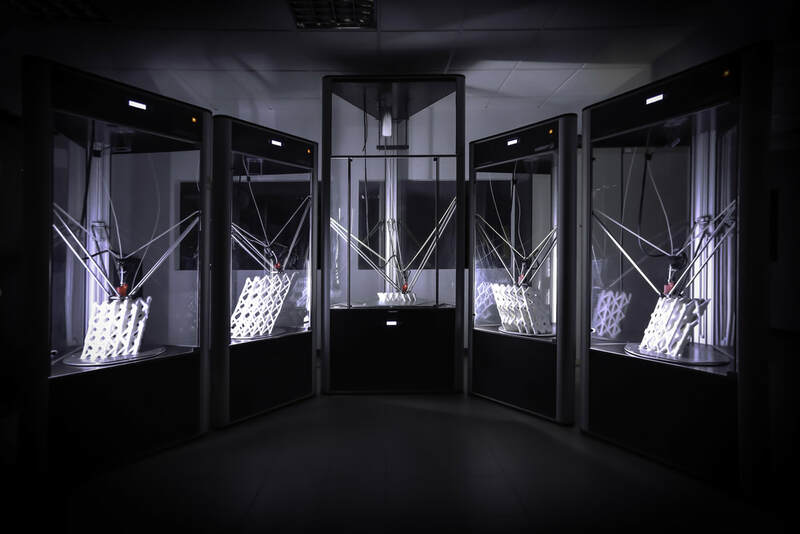 The fabrication process of the building components was based on a Delta WASP printer farm installed in the Saperlab of Department ABC of Politecnico di Milano, where multiple production processes allowed for a continuous production for a total of 4352 hours. 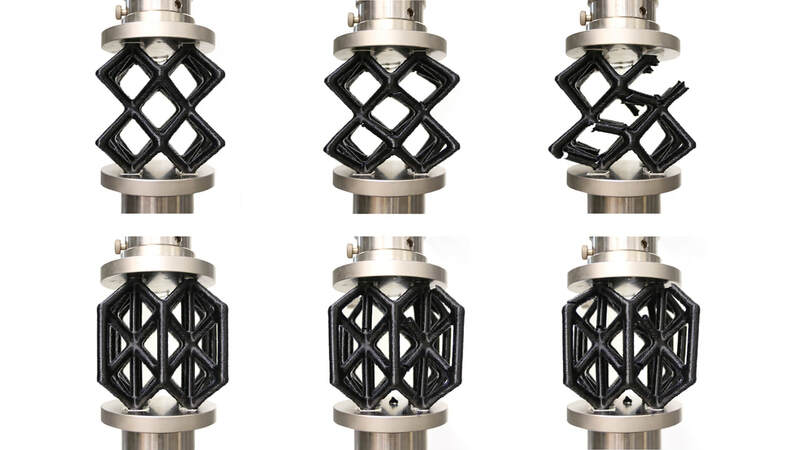 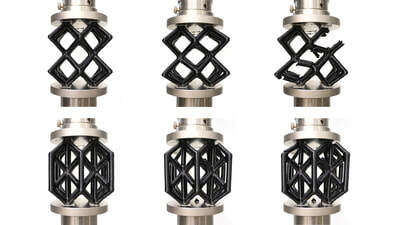 The use of an experimental extruder was introduced to shape stiff components within a minimized amount of time. 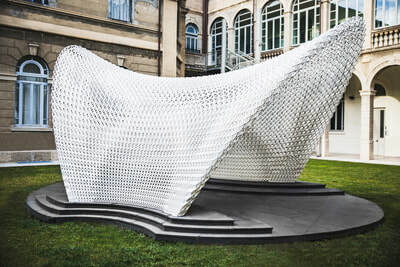 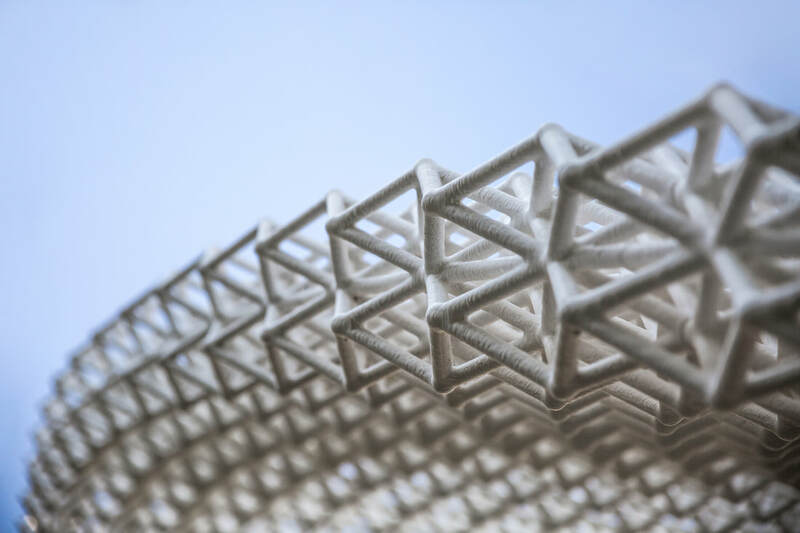 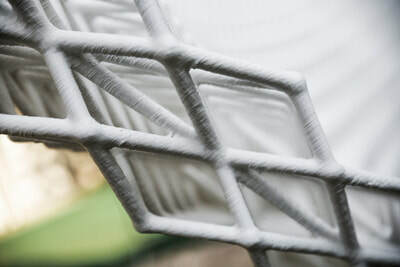 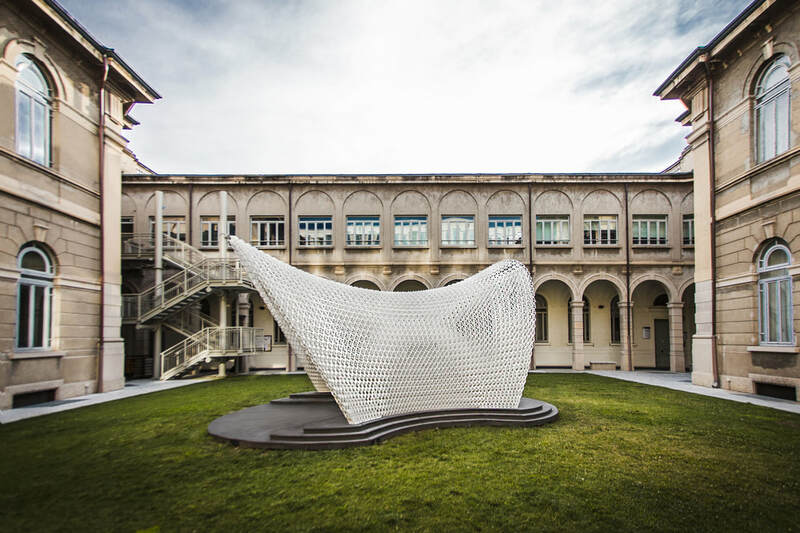 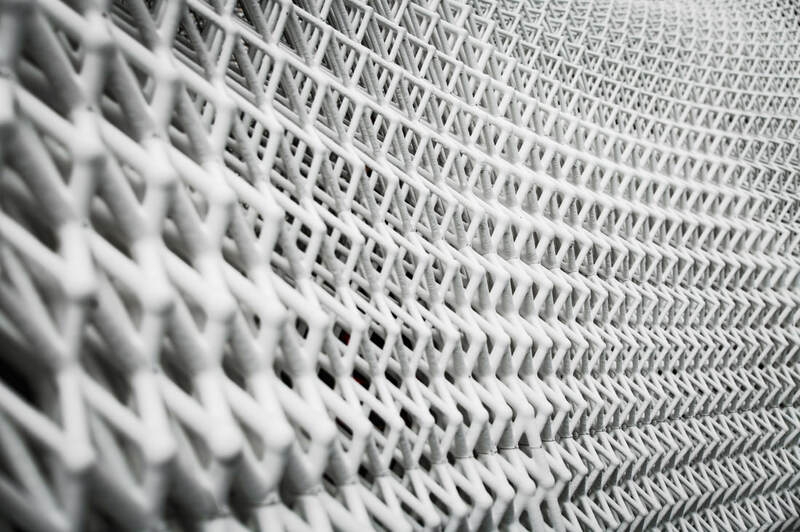 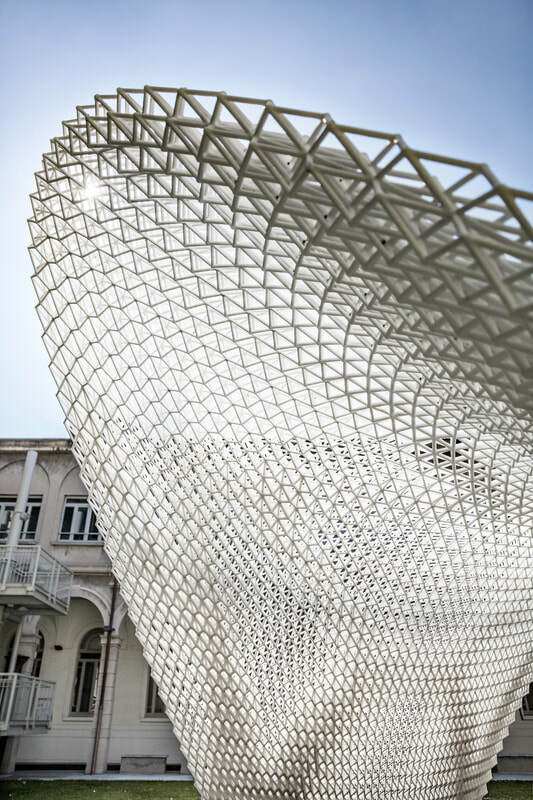 The synergy of design, material and manufacturing technologies allowed the conceptualization of an innovative construction technique based on an additive process which builds architectural forms conceived with a load-responsive material organization. 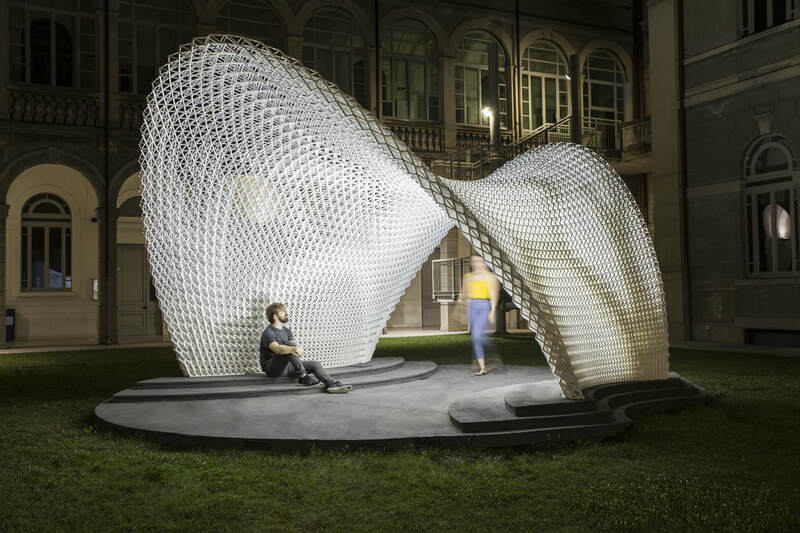 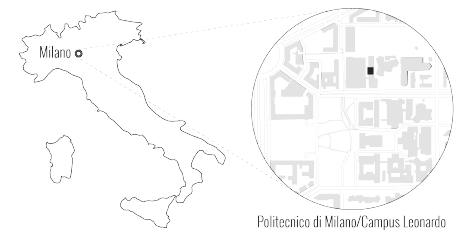 This built demonstrator has been conceived and developed in Roberto Naboni’s doctorate in the Architecture Built Environment and Construction Engineering PhD Programme of Politecnico di Milano (XXIX Cycle) - supervisor: Prof. Ingrid Paoletti, tutor: Prof: Enrico De Angelis.